Last year, the Japanese Mafia destroyed America's most important port. But has Japan done anything about this? They have not. The US should send a wind-proof invasion force to take out those good-for-nothing card playing gangsters. Voter apathy is a major problem in the US, yet we saw in 2004 just how much the Ukrainian people care about election results. These people are like Mexicans, except they've been irradiated by Chernobyl and as a result are rife with superheroes, another thing America lacks. Many have proclaimed that America is dead. But the Ukraine? Ukraine is not dead. This one is a little different, in that it's a guerilla campaign carried out by civilians. It has been suggested by some that we immigrate to Mexico to steal all their low-wage jobs that they don't want to do themselves. This will teach them how it feels to have low-cost goods and no jobs available except hard ones requiring a high school diploma. If we do this, they'll patrol the borders so we don't have to. 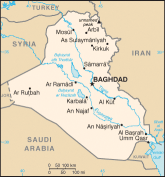 The formerly-secular nation of Iraq underwent an upheaval in 2003 and recently elected a theocratic government. The US knows quite well that separation of church and state is one vital aspect of a free people, so we should attempt to bring this concept to Iraq, or at least parts of it. 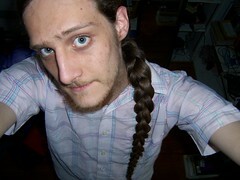 Unfortinately, this may require a large deployment, and many of our troops are already occupied. The Dutch have something we need: the ability to build strong levees to keep their cities from flooding. Now, I'm not quite sure why we can't just hired some of their engineers to come over here and teach us how to do the same, but apparently they're all unwilling to share this precious technology. We must strike quickly to conquer their pathetic nation and acquire their technology. We'll also get a huge island covered in ice, with which we can combat global warming. America has clearly lost its moral authority with the world. We messed up, and everyone knows it. What we need is a respected figurehead, and it just so happens there's a well-known one in the Vatican. 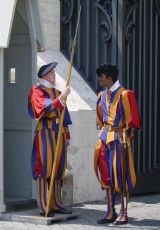 If Italy will allow us to launch a strike on the Vatican from their territory, our only obstacle will be the crack squad of Swiss Guards in their tights and poofy pants. We can take 'em.